Nothing makes the story of a horrific tragedy more frightening than when the location is named after it. Buildings, forests, mountains. It doesn’t matter. By proxy, the place becomes even more terrifying when you name it after some poor, wandering soul. Someone who is believed to have died there by some gruesome circumstances. Someone who is upset about his or her untimely demise and has vowed revenge upon the responsible parties. Ergo, they return from the otherworld to haunt the living, usually in some decrepit mansion or graveyard. But some spirits have a little more gravitas than their living dead companions. Abandoned mansions won’t do. They need their own piece of prime real estate. It makes it so much easier for a disembodied spirit ghost to find the appropriate place to haunt when the ghost’s name is right there on the map. There are no GPS systems in Hades. Asheville, NC, has its fair share of spooks and ghouls. Helen’s Bridge is located high atop Beaucatcher Mountain just outside downtown. 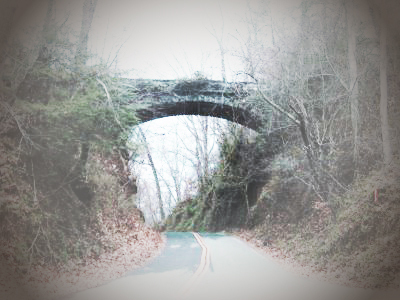 Asheville, Beaucatcher Mountain, ghosts, haunting, Helen's Bridge.